Located near the City of Wilton, the Wilton Trails Northwest has 37 miles of ATV and OHM riding. Winding trails pass scenic vistas overlooking the valleys along the abandoned Soo Line North Railroad grade. Smaller loops branch off the main trail for additional riding. 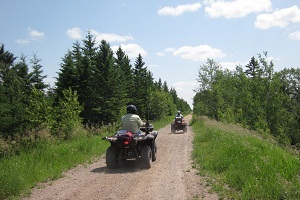 The trail is provided by Beltrami County and maintained by the Northwoods Riders OHV Club. GeoPDF map | What is a geoPDF? Not a resident of Minnesota? Buy your trail pass online, phone or in person. From Bemidji, go 3.2 miles west on Hwy. 2. Turn south on Pete Ln., before Hwy. 89 junction. Park near back of parking lot.